Back in December, Tess and I were awarded the 2012 Blog of the Year Award by Nancy at The Cloistered Heart. (Thanks Nancy!) We were thrilled about it. Not only does someone read our blog, but our words have spoken to her. Alleluia. It was definitely a shot in the arm. With the award went a list of instructions - choose other blogs to give this award to, let them know, include the list of rules into your blog post, etc. And Tess and I pondered. For days which turned into weeks, which turned into 2013. So the other day while talking about the logistics of it all, we realized that since it's no longer 2012, and there is no 2013 blog of year award that we know of, why are we giving out this award. The Pinkerton and Beazly combo at Dumb Old Housewives - for their tongue-in-cheek punditry and their simple thoughtfulness. Bobby at Peter's Barque - for writing from the heart, with all his heart. Seraphic Singles - for not forgetting the Catholic singles after marrying her true love and moving to Scotland. And there you have it. We hope you'll be as tickled to receive this award as we were. Thanks to all of you for building the soul of the internet, in your own unique way. 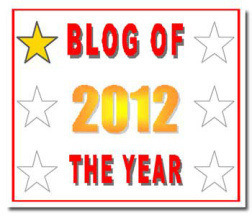 I AM tickled, especially now that I've checked out all of the other blogs you awarded. What a wonderful group of bloggers to be among. THANK YOU. Nancy, what you are giving to us is very special. It - and you - are such a blessing. Thank you for encouraging us! I was thrilled to see my blog amongst those listed. It was truly an honor and I am humbled by it all. Thank you all so much :) (I feel like I should be thanking my mom or sumptin') Peace be with all of you. 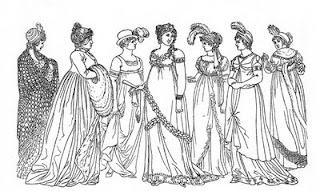 No worries Tess, my mother reminds me of being thankful to her at every turn...yes Mom....or I should say..."Oui Maman..."
Thanks, dear Feminine Gift girls. What a pleasure it is to spread the good news of the new feminism among such lovely ladies. Glory be to God! The award is much deserved, Katie Rose. Thanks for all you do!